Two weekends ago was my brother-in-laws wedding! What a weekend. So much fun but by Monday I was exhausted (and we all probably read what happened that Monday….)! There was lots of family in town and lots (I mean lots) of fun. The wedding was awesome and the weather cooperated. It was a gorgeous Seattle fall day! Josh & Kylin’s wedding was held on an old ferry-boat on Lake Union with an amazing view of downtown. It was held in the evening so the view on such a clear day was gorgeous! The bride and groom both looked stunning and I am so happy to have Kylin as a sister! Over the wedding weekend, the Mr. and I were able to open our home for out-of-town family to hang out at and even have some stay at. Thankfully we have two extra bedrooms so we were able to have 4 guests on any given night!The first night we had the hubby’s parents and grandma and grandpa. On the next two nights we had cousins. As I love any excuse to cook, I hosted a brunch for 10 on the day of the wedding. The groom had stayed with us the night before so I wanted to be sure he had a hearty meal in him and also it gave the family a good excuse to come see him before the ceremony. There was no question on what I was going to cook. A few weeks early at my book club brunch, my friend Amanda had made the most amazing meal! I just knew it was perfect to cook for the family. They were Apple Coconut Waffles and a breakfast casserole. Both recipes came from a blog Amanda introduced me to called Multiply Delicious. So far, all recipes I have tried from this blog are amazing and healthy. I loved the flavors in both of these. 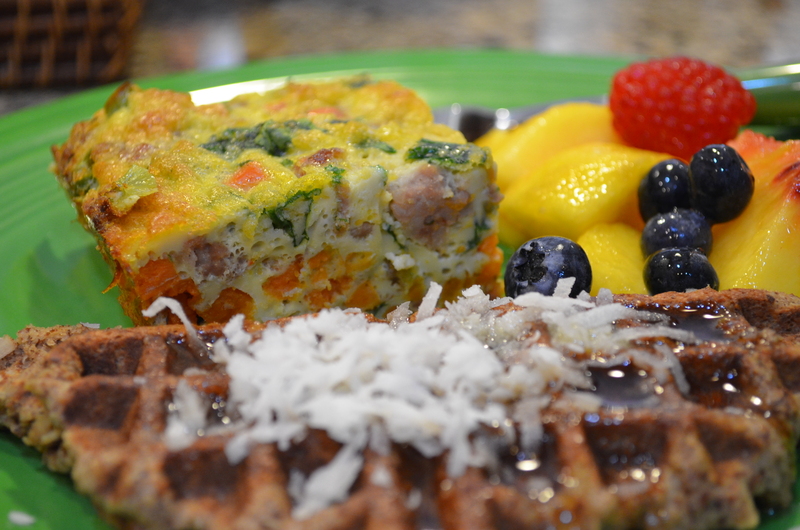 The casserole has sweet potatoes in it (YUM) and the waffles have coconut which I absolutely LOVE! Overall these were pretty easy. Some of the ingredients were definitely ones I didn’t have on hand, but thankfully I had no problem finding them at our Whole Foods! Overall I think they were a big hit as I didn’t have any leftover waffles and I had very little of the casserole. If you want to try something different, I highly recommend either of these recipes. They are great each by themselves. Recipes are below. Instructions: In a medium bowl, whisk together eggs, maple syrup, vanilla, and water until smooth. Add the almond flour, salt, baking soda, arrowroot powder, and cinnamon and mix thoroughly. Add apples and coconut and mix to combine. In a preheated and greased waffle iron, scoop batter onto iron and cook until golden brown or as your waffle irons instructions. You can top waffles with additional coconut, toasted pecans, apple slices, berries, etc. and serve along with maple syrup or jam. Instructions: Preheat oven to 375 degrees and grease a 9×13″ baking dish with coconut oil or whatever you choose. Set aside. Prepare veggies. Dice sweet potatoes, chop spinach, and dice up green onion. Let each separately aside. Heat skillet over medium-high heat. Remove sausage from casing and add sausage to skillet. Cook until browned and cooked through. Remove sausage from skillet keeping the sausage grease. Add sweet potatoes to grease and cook until tender, stir occasionally, about 10 to 15 minutes. Remove sweet potatoes and place in bowl. 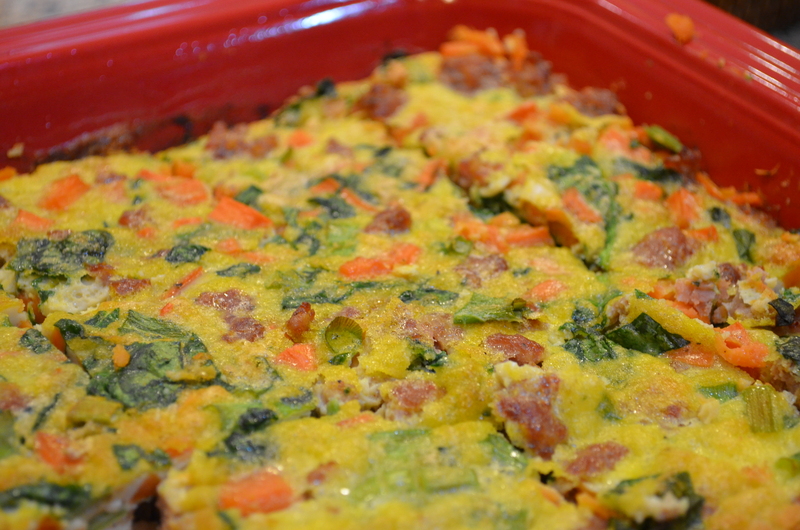 Toss sweet potatoes with spinach, green onion, sausage, and salt and pepper until well combined. Place the mixture into your prepared dish, spreading evenly across the bottom of the dish. In another large bowl, whisk eggs. Pour egg mixture evenly over the sausage and veggie mixture in dish. Bake in preheated over for 25 to 30 minutes or until set. Allow to cool slightly before serving. Cut into squares and serve. Serves 8-10. As I had 10 people, I doubled the waffle recipe and I did 1.5x the casserole recipe. Just writing about these make me crave them again. This will definitely go in my list of brunch ideas for the future. Just amazing! Definitely recommend checking out the blog where these recipes are from…there are a lot of other interesting ones that I look forward to trying! With the Mr. out of town, making dinner just for myself isn’t very exciting. And, right now, I am trying to be really good and work my way through stuff we have in the cupboards/freezer/fridge. When he travels I tend to get in the habit of picking up sushi from the grocery store (I know, not the best but I still enjoy it), or eating cottage cheese, etc. But this week, I am making myself eat from what I have at home and use up some items so we don’t waste food! When it comes to using up items in the fridge, I often create stuff that sounds pretty odd. However, most the time (not always) they taste delicious! And thankfully this latest experiment turned out great and was totally satisfying. 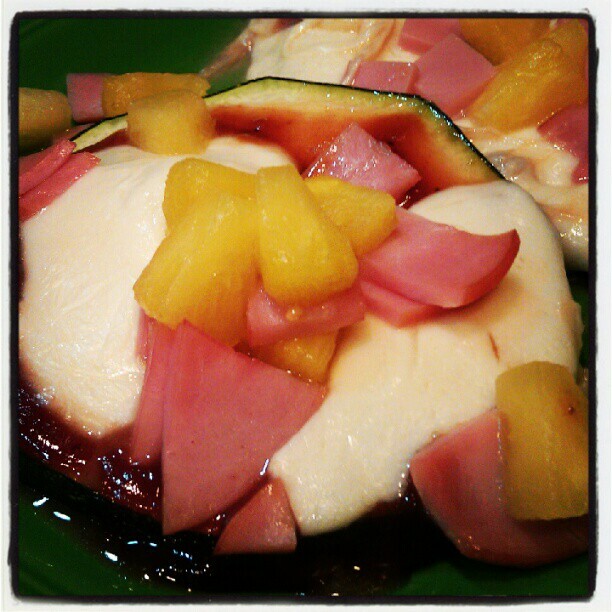 It was BBQ Hawaiian Zucchini Pizza. Odd I know, but man did it taste GOOD! It was super easy too. I took the giant zucchini I had and sliced off four pieces each about a half-inch thick and placed on a baking sheet. I then broiled them for about 7-10 minutes until they started to soften (flipped half way through). Next step was I spread a tablespoon of BBQ sauce on each slice, then topped with fresh mozzarella slices, Canadian bacon and pineapple chunks. I then put them back in the oven on broil and cooked them until the cheese was melted. End result in my mind was delicious. I made enough so that I could have it for lunch the next day!!! To go with my pizza and to use up a few of the other items I sliced up a small cucumber and a bunch of tomatoes and a few sliced black olives and tossed them together. I then topped with a little olive oil, balsamic vinegar and salt and pepper. Wish I had a picture as it too was yummy. Back to work for me! Enjoy your day! These last few days/weeks have been crazy! I don’t really feel like I have been able to cook. (Well, with the exception of Becca’s baby shower where I did a ton of cooking on Sunday! But more on that in a later post…that one will take some time!) Instead, we (the Mr. and I) have been going to others houses for dinner/fun events (game night, family birthday, etc. ), or out to eat, or quickly grabbing whatever we can find to eat in the house. Monday was the first night the Mr. and I were both home with no major plans. FINALLY! However, we got home kind of late from work and I haven’t been to the grocery store in ages to do proper shopping so it was a what do I have that needs to be used up kinda night! Directions: Cook orzo according to package. 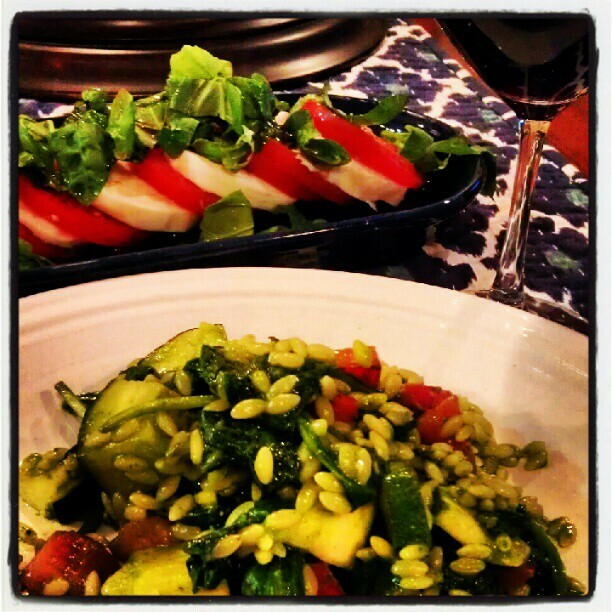 While orzo is cooking, chop up the zucchini, and tomatoes. Heat small amount of olive oil in pan and cook zucchini for about 5 minutes (or until it starts to slightly soften). After orzo is cooked, drain and return to pan. Add in spinach and stir (spinach will start to wilt). Add in zucchini and tomatoes and mix. Add spinach pesto and salt and pepper and toss. Serve and Enjoy! Also, I added a little bit of Parmesan to top it off. For the Caprese I took sliced tomatoes and sliced fresh mozzarella and alternated each on a plate. 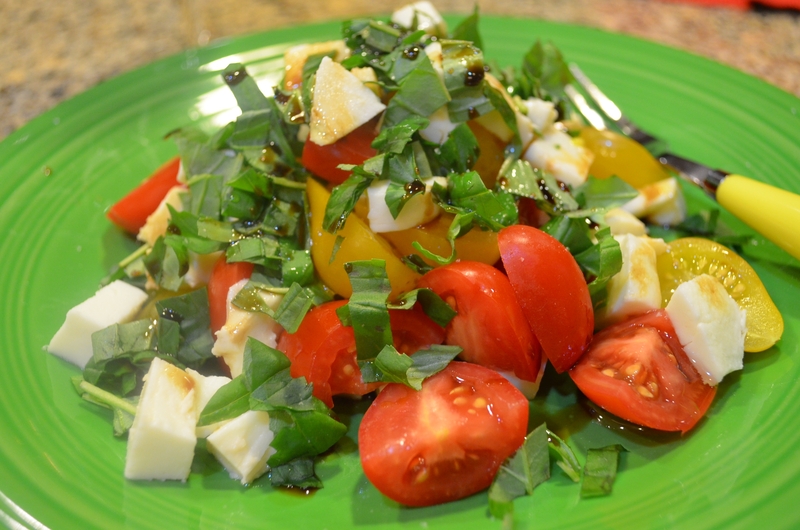 I drizzled it with olive oil and balsamic vinegar and topped with fresh sliced basil! Simple and delicious! Hopefully after this week/weekend things slow down and I can get back to cooking more often! I have so many recipes I want to try! When we were in Greece on our honeymoon we had a watermelon and feta salad that we absolutely loved for lunch one day. After sitting on the beach in the heat all morning, it was so refreshing and such a delicious combination of flavors. Ever since we have been talking about recreating the salad. Well, the other day when we had our friends Luke and Michelle over for dinner, we just happened to have all the necessary ingredients on hand! So at the last minute, I decided to make my own version of the salad! Originally I wasn’t going to do any of the cooking as we had a Zaw Pizza coupon to use and as we had been so busy I didn’t have the energy to do my usual form of entertaining. However, I just couldn’t resist as a) we had all the ingredients, b) it is super easy to make and c) I felt we needed to add something sweet to the mix 🙂 Although it didn’t really go with the pizza (BBQ Chicken) and spinach salad, I still decided to add it to the menu! If you haven’t had Zaw Pizza I highly recommend it. I love their pizzas. All the ingredients are super fresh, the pizzas are made but not cooked so you take them home and make them when you are ready (take like 10 minutes to cook), the crust is thin and comes in wheat, original or gluten-free and they have some really unique types of pizzas (pear, blue cheese and prosciutto for example)! It is the perfect dinner to pick up when you are tight on time! Cut rind from the watermelon, then chop into 1 inch chunks. 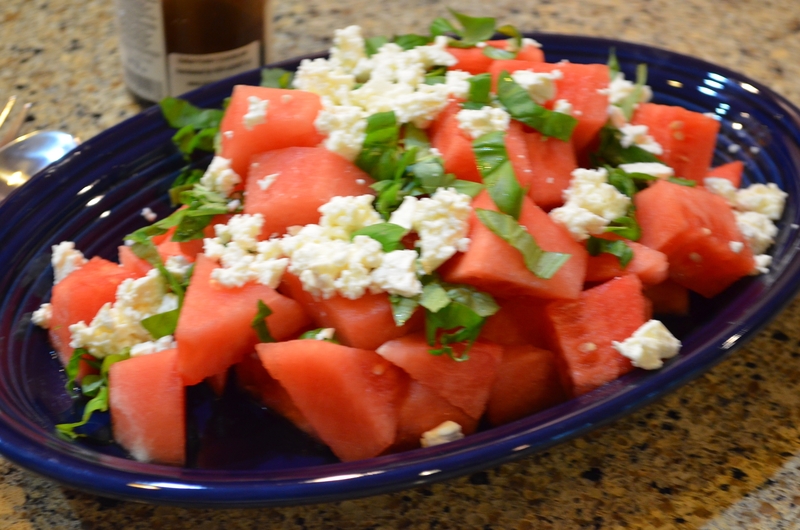 Sprinkle crumbled feta on top of watermelon. Drizzle balsamic glaze over watermelon/feta. Top with basil. Enjoy! We have a big weekend coming up. Tomorrow night is game night! Morgan and Chris are hosting this month and we will all be bringing ingredients to make our own pizza’s. Then on Saturday my mom is hosting a Birthday Party for me (yup, my birthday is in just over a week…the big 3-2!). Family and some friends will be going to my parents house to BBBQ and watch UW play LSU (GO HUSKIES). Then on Sunday, I am helping host a baby shower for a very close friend of mine. As I love to cook, I am in charge of all the food. As I know Becca (mom-to-be) looks at this blog I can’t go into details of all that I am making but will be sure to post about it after the big event!